A quality down pillow form in a 22" x 22" size. This plump, budget-friendly pillow insert is filled with 95% feathers for firmness and 5% down for loft. Encased in a 100% cotton feather-proof cover. The reviews were excellent ! And the two comments about feathers not poking through and the fluffiness factor were what won me over. Price, and the reviews said the feathers didnt poke through! The positive reviews helped me make the decision. I love these pillows with their dense feathers! Very reasonable price compared to other stores. I was looking for inserts for new Pottery Barn pillow covers I had ordered. Nice price ang good reviews lead me to purchase these. purchased 20x20 pillow covers I needed inserts for. I was told going up 2" would provide a "plump fit". Best price and quick shipping. for 20x20 pillow cases. I have used these before. Great quality and price! Needed replacement inserts for my couch pillows. They were a good price and the reviews were positive. I need these to fill a couple pillow covers I ordered from Pottery Barn. I love the flexibility and comfort of a down pillow and these will be perfect along the couch. Quality pillow form, just the right amount of down to fill out the pillow. I ordered these for other pillows and just love them! Hard to find all down pillow inserts in retail outlets. It's so easy to order from Online Fabric website! The price--seemed more reasonable than others I have looked at, using for a vacation cabin! Looking for a DOWN pillow insert for 20"x20" cover: you suggested this one! Love the feel of these forms! Cannot find this type and size locally. I've ordered them in the past, so I feel comfortable with the quality. I wanted good quality pillow inserts for a reasonable price. My local design store wanted more than twice the price. I’ve purchased fabric from OFS and had great results. Why not give this item a try? 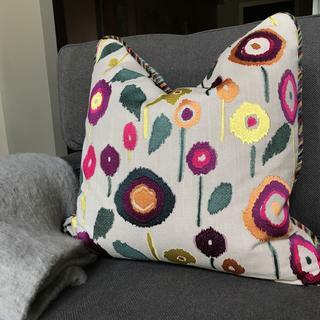 can't wait to sew new pillows! Need something soft for pillows on sofa. Because you had the best price online. Excellent choice of available sizes. What are the shipping Costs to zip code 33040 ? Are these pillows intended for decorative pillows or for seating? These are for 'pillows' The fill can be manipulated, fluffed, and reshaped. A seat cushion typically has a foam center so that it is resilient and maintains it's original form. I use them for decoration! my pillow covers are 20" square. should I buy a 22" or 24" pillow insert? Thanks! BEST ANSWER: We suggest ordering pillows 2" larger than the cover, so this 22" square pillow would work well. BEST ANSWER: The thread count of the cover can vary as it is intended to be used as an insert for a pillow cover. Love these forms! They're full and fill out my pillows perfectly! Works great. Soft and comfy. Full for 20" x 20"
Awesome pillow forms. Very happy with the quality and fullness of the pillows! I love the fact that the quills from the feathers will not come through the cover. On so many of my old pillows, the quills come through, and it drives me crazy. These pillows have a lot of stuffing in them and I ordered a size larger than my pillow case, and they fit perfectly. I will definitely be ordering more in other sizes. These pillow forms are excellent. I purchased, as many people have noted, a size above the actual size of the pillow case. The difference between this new one and the old one is remarkable. I will be ordering another one soon. Great price and worked very well across the back of a sofa.